Welcome to the year of the smart home. The development of connected technology has hit cruise mode and 2015 is prime time for smart household appliances to shine. Controlling daily household activities such as doing laundry, locking doors and even vacuuming is now possible to manage from a smart phone thanks to advanced software and internet connectivity everywhere. 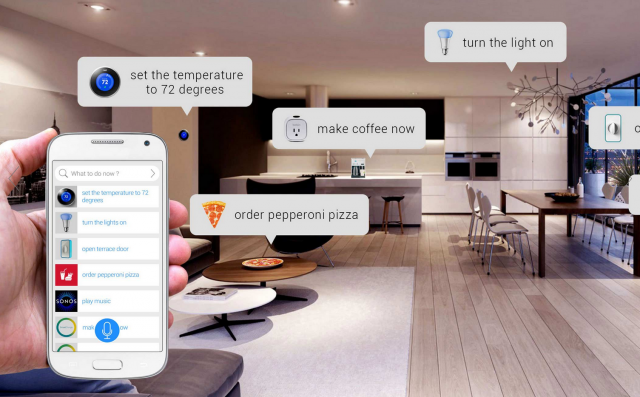 Android and Samsung are leading the smart-home race by easing the access to a smarter life — the tech pioneers are connecting people to their devices and devices to their appliances by creating hubs of automation. These management hubs are housed on smart devices (tablets, smart phones, smart wearables, etc.) and give users access to control various appliances with a tap of the screen. It’s simple to join the smart home movement by checking out these life-changing android-based applications that help run household operations in tip-top shape. It may be winter, but it doesn’t mean you can’t think of warmer days on the way. Air conditioning can be a touchy, temperature-sensitive subject and the feeling of coming home to a scorching hot house on a dreadfully humid summer day sets just about anybody off. Summertime is when the living should be easy… and breezy — and now you can do just that by starting up the Quirky Aros smart air conditioner using the Android Wink app, before you get home. This smart AC unit cools the house automatically according to your personal timing and temperature preferences; not to mention, it does it in the most efficient manner with budget in mind. Lighting has a huge effect on the mood of a room. If setting the perfect ambiance is important in your home establishment, the Philips Hue Connect Bulb should do the trick. Flipping on the light switch or changing a light bulb gets a new meaning. This wireless lighting is wirelessly controlled. There are actually a plethora of Android applications available to accompany the smart lighting system, from the simple straightforward Hue Control app that allows you to control lights manually via Android phone to the Instagram of lighting, Hue Pro, where artistic-minded users can paint the room right from their phones by combining various lighting combinations and moods like “Concentrate” and “Deep Sea” settings. Keeping your home safe is a top priority. The ADT Pulse App connects to a corresponding smart home security system so you have total control of monitoring your house from anywhere. Through the android-compatible application, owners can quickly activate alarms, watch live video feeds via cameras set up around the house, check motion sensors, doors and windows, and view activity history for those who have entered the house. Although each individual smart appliance usually has a corresponding product app to go with it, technology is increasingly connecting them altogether in one hub. Innovation like the SmartThings Hub allows you to add as many smart devices as desired to the same application thus streamlining the process of control. You can find your speakers, thermostat, vacuum, lights, and home security system within one app. The advancement will become prominent in 2015 because it brings together the components of a smart home. Everything is under one roof, physically and digitally, and comes with the ability to be remotely managed outside the house. With truly progressive Android-operating software in place and tech giants fully supporting a smart revolution in the home, life is ready to be operated at your fingertips. The aforementioned software is just a handful of the best out there which has spiked a massive emergence of ingeniously connected pairings of home appliances and powerful apps that run them.